"Our prayers and condolences on the passing of your mother. ..."
"I love you Aunt Thelma ~ You and Jim (Carolyn & Dennis)..."
"I love you Aunt Thelma. You and Jim (Carolyn & Dennis) were..."
"We will miss Thelma. 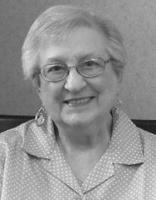 Mom and I were fortunate enough to..."
Thelma E. Wilson, of Bowdon, GA, died Mon., June 8, 2015. She was born Feb. 22, 1922 and raised in LaCenter, WA. She was a Clark County resident for 90 years and spent the last three years with her daughter in Georgia. Thelma graduated from the University of Oregon with a Masters Degree in Education and spent many years teaching grade school in the Evergreen District. She enjoyed traveling with her daughter and last year completed a dream of hers to visit Ireland. Thelma is survived by a daughter, Carolyn Wilson of Bowdon, GA; a son, Dennis Wilson (Susan) of Coeur 'de Alene, ID; one grandchild, Joseph Wilson of Atlanta, GA; sisters, Edna Stradley and Kathryn French, both of Vancouver, WA; and numerous nieces and nephews. She was preceded in death by her husband, Jim Wilson; parents, Andrew and Estella Beasley; and brother, Kenton Beasley.